This super easy 3 Ingredient Swirled Cookie Butter Bark requires very little hands-on time and is perfect for last minute gifting! Sometimes you just need an easy recipe. Life is busy. Schedules are tight. But you still want something delicious to bring to your next holiday party (or just to snack on while you’re working on your busy to-do list!). I usually turn to bark recipes when I need a last minute dessert/candy to serve or give as a gift. There are so many different variations you can make, and they are just so easy to make. 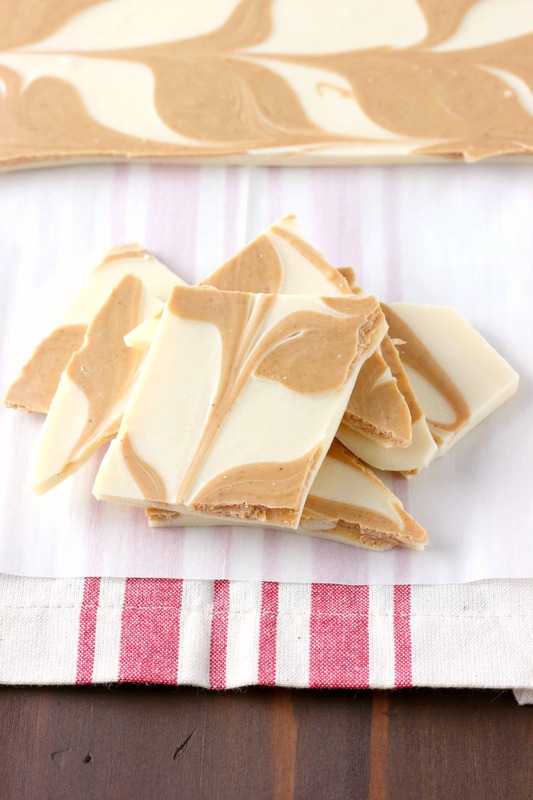 This swirled cookie butter bark is a new favorite. All it takes is three ingredients. 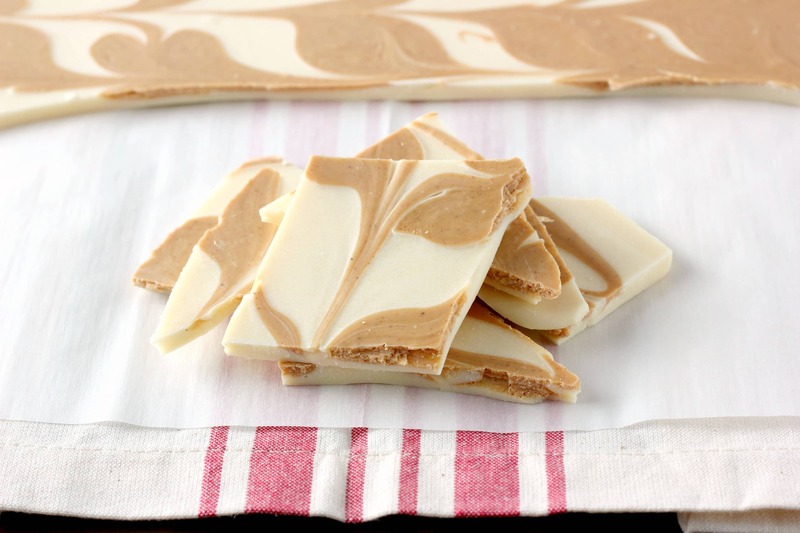 All you need is white chocolate/vanilla almond bark, cinnamon, and cookie butter. Does your Costco sell huge containers of Biscoff? You may just want to pick up a container the next time you’re there so you can make multiple batches of this bark and still have some to eat plain! Melt your chocolate in two separate bowls, swirl cookie butter and cinnamon into one of the white chocolate bowls, spread plain white chocolate on pan, swirl cookie butter chocolate over the top, and refrigerate. That is all. Have last minute guests or forgot that you need to bring something to a holiday party? Quick throw this candy together, and let it cool while you get ready. Super simple ingredients. Super easy to make. Super addicting to eat. You may just way to make a double batch right away! Line a 12x18 inch (or close to that size) baking sheet with parchment paper. Melt 24 ounces of white chocolate according to manufacturer's instructions. In a separate bowl, melt remaining 8 ounces of white chocolate according to manufacturer's instructions. Stir cookie butter and cinnamon into the 8 ounces of white chocolate until smooth. 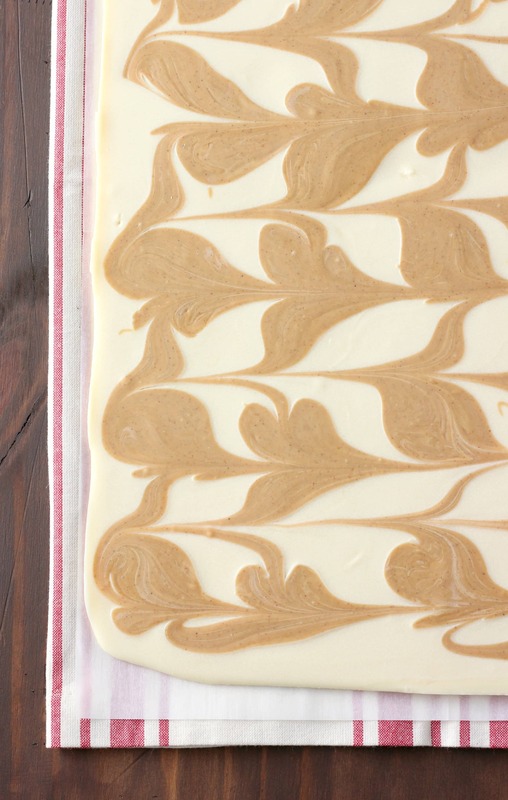 Spread 24 ounces of white chocolate onto prepared baking sheet. Spoon cookie butter chocolate over the top. Swirl the cookie butter chocolate through the white chocolate using a knife. Place in refrigerator and allow to refrigerate for at least one hour to cool and set. This does look delicious and addictive. A pretty addition to the holiday table and also to give! Now I need to pick up some Biscoff! So pretty! I love the simple, earthy colors. 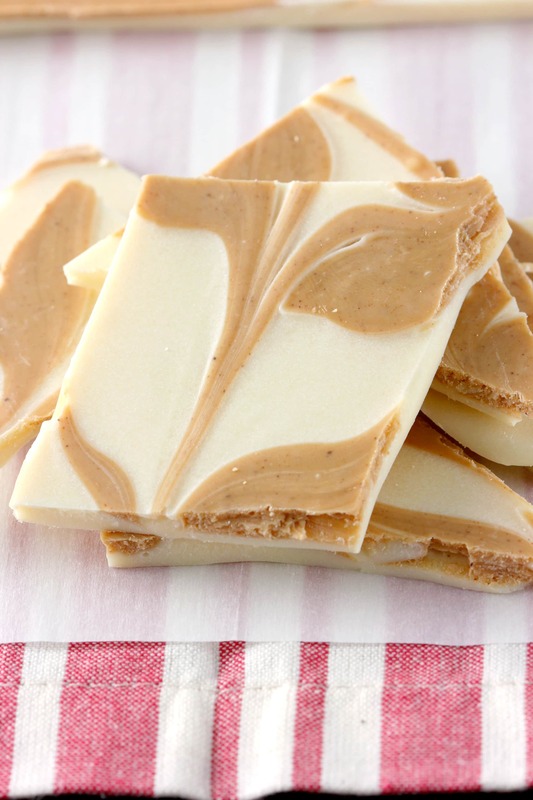 Cookie butter bark is such a genius idea! This looks sooo yummy! I love how easy it is too, definitely going to have to try this one! I would never have thought to do a bark with cookie butter — what a great idea! 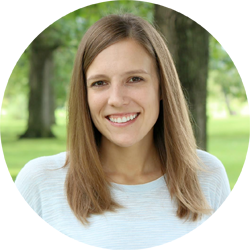 These are the prettiest swirls, too, Jessica — I’m afraid mine would be a hot mess! This bark is so pretty! I love that there are only 3 ingredients too! The cookie butter and white chocolate combo sound perfect! Mmm you had me at cookie butter, I’m addicted to that stuff! This bark looks SO good, Jessica! I agree…sometimes you just need an easy treat! 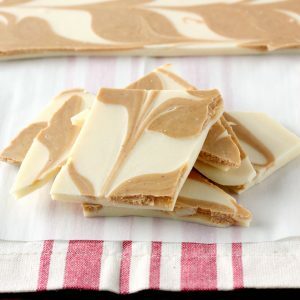 Love the biscoff swirls in this creamy bark!!! OMG, I found that huge jar at Costco last week and I was in heaven! Cant wait to try this – it sounds fabulous!